With more and more ship recyclers looking to comply with stricter environmental standards, the demolition market could be seen as one in transition. Still, as Clarkson Platou Hellas said in its latest weekly report, “the market feels overheated at this current time with the majority of cash buyers purely reliant on Bangladesh who remain strong in their appetite, for now, for purchases that can give delivery ‘pre-Ramadan’ (5th May). The strong consensus however is that, once Ramadan arrives, the yards will be full in Bangladesh and with the slowdown of production (dismantling of vessels), during this period, the market may correct downwards. However, we suggested recently that there was more emphasis on Green ship recycling and this week clearly confirms that sentiment with a few sales being concluded into India for Green recycling, as reported below, some of which are interesting numbers. Following a substantial overhaul to their yards, in terms of financial and infrastructure, the recyclers in Alang are now seeing some reward for their upgrades to their yards and with more Owners continue to ask about the Green recycling facilities, India looks set to be busy with such acquisitions in the future. There are reports of some slight improvement in sentiment in Pakistan this week but unfortunately, their price levels remain some USD 20-30 per LDT lower than their counterparts in Bangladesh. Maybe we shall see some renewed optimism from the Pakistani breakers to acquire tonnage prior to their Ramadan holidays too!”, Clarkson Platou Hellas concluded. 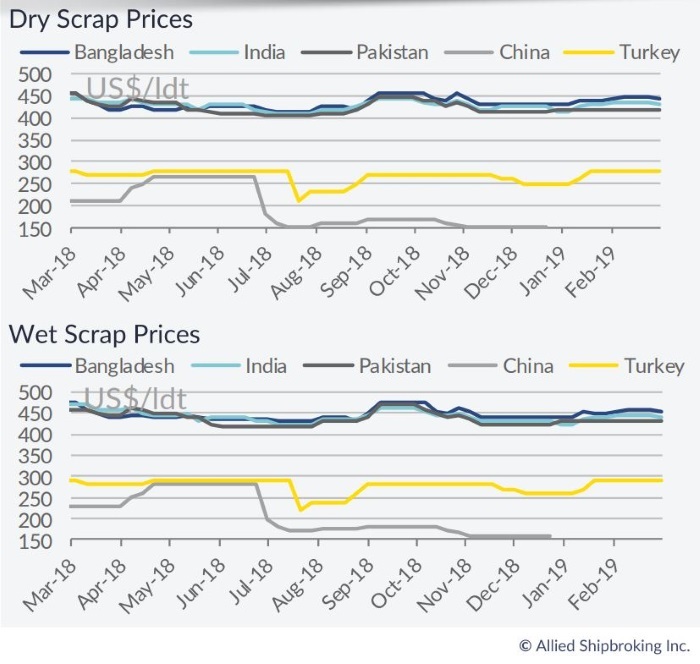 In an another note, Allied Shipbroking reported this week that “despite the disappointing outlook in the dry bulk segment, we have yet to see any sharp increase in scrapping activity (with a small exception being that of the Capesize segment). This week showed a complete lack of dry bulk demo sales, while things still remain fairly difficult in the freight market. However, given that we have seen some increased interest during previous weeks, the expectation is that activity should ramp up significantly sooner or later, especially if the current freight rate slump persists. On the tankers side, the market seems to be more stable with a steady stream of vintage carriers being recycled during the last couple of months. Bangladesh continues to hold the top position for the cash buyers for yet another week, with activity however starting to slow as local breakers have started to show diminished spare capacity. In India, where activity seems to have been recovered lately due to the increased interest for green recycling, the prevailing instability in offered prices has seemingly discouraged activity for the time being. With steel plate prices in Pakistan slowly firming up, local breakers have been able to push for a slight rebound in interest and competitiveness, but activity remains at relatively shallow levels”. Meanwhile, in a separate report, GMS, the world’s leading cash buyer of ships, reported that “after a frantic period of activity through most of March (especially last week, where a healthy collection of fixtures were reported), sales have somewhat slowed this week. Surprisingly, India lost several high profile HKC SoC vessels for green recycling last week, to the only RINA approved yard in Bangladesh. However, given that this yard has taken in its quota, India has managed to get back into the buying this week, with a few interesting (market and private) green recycling sales. In Gadani, since a majority of the local recycling yards have been painfully empty for some time now, we finally witnessed the Pakistani market waking up (about time!) as appetite seemed to grow this week. As such, even though the price gap remains significant at present, it may not be long before we see Gadani Buyers competing against their Indian counterparts, on standard vessels once again. Bangladesh remains the point of reference for most of the market tonnage – with rates almost USD 20/LDT above their nearest competitors in Alang. However, as has been expected for some time now, Bangladesh may be due for a breather in the month(s) ahead and we may see the focus start to shift back to the Indian and Pakistani markets once again. Meanwhile, the Indian market has been enjoying its share of cheaper priced units this year, with many offshore vessels and rigs heading their way, in addition to those units intended for strictly HKC SoC green recycling (with only one competitive Rina approved HKC yard in Bangladesh that is now full, having secured two decent LDT vessels, including the Vale cape sold last week). Out West, Turkish steel plate prices declined some more this week, though prices have managed to stay buoyant amidst a strong local demand on the back of a famished supply of tonnage, that has kept Aliaga Buyers surprisingly aggressive this weeks. 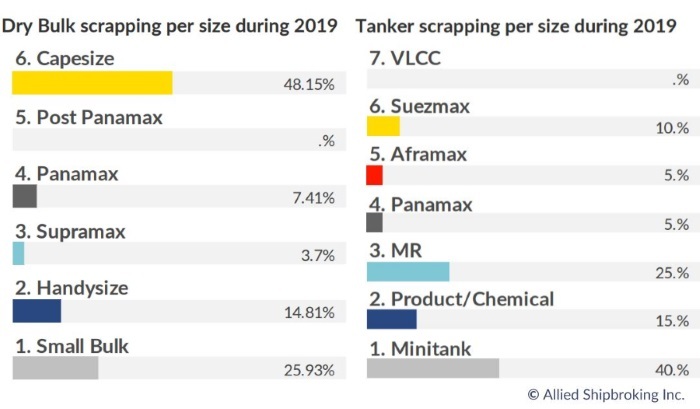 With the first quarter of 2019 now concluded and charter rates, particularly in the dry sector, still in the doldrums, the supply of tonnage (older Capes in particular) is set to continue as we head into the second quarter of the year”, GMS concluded.